Spec’s approach to healthcare seating and tables is revolutionary in its simplicity. Our healthcare products are designed to meet all core requirements of hospital environments while still offering an array of options, price points and scales so customers can specify the best possible solutions. 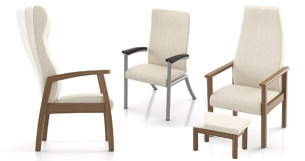 Beyond our extensive public seating offering, we also manufacture a wide selection of specialty products that have been designed for specific settings, such as Behavioral Health facilities, hospital patient rooms, and other heavy-duty applications. Spec offers the Cooper Collection, Companion, Midway, Gravity, 2000 Series and all three Snowball designs as bariatric models. Chairs can be specified as freestanding or connected. Bariatric seats are 30" on all models except for Snowball, which has 26" seat widths. Most bariatric seating designs are dynamic load tested to 750 lbs, while Snowball designs have been dynamic load tested to 500 lbs. All bariatric products have been designed to be easily maintained in the field—and to withstand the unique demands of the market. Spec offers a wide variety of solutions for patient rooms to help create environments that support healing. Responding both to the needs of the patient as well as their guests, Spec offers overbed tables, bedside cabinets, and chairs for patients and visitors. Highback Patient Chairs give the patient a comfortable and supportive alternative to bed rest. Some models are available as rockers. Spec’s overbed tables combine attractive, ergonomic design with infection-resistant features uniquely suited to the healthcare environment. Choose between two height-adjustable base designs offering complete mobility. Tops are available in rectangular and kidney shapes; both shapes are available with laminate or thermofoil tops. Laminate tops are available in any standard Wilsonart, Nevamar, Formica, Pionite or Arborite matte finish offering. Thermofoil tops are offered in a range of eight standard finishes, all with an optional spill collector edge. A variety of bedside cabinets is available for patients to store their belongings. Choose from a range of additional options, including spill collector tops, three different pull styles for the drawers, gallery rails, plastic drawer inserts and magnetic key locks. Bedside cabinets can come with casters, fixed feet or both. External options include thermofoil tops and fronts, or laminate tops with melamine fronts. The cabinets' fronts and backs come standard in melamine, while eight standard thermofoil finishes designed to match with melamaine and laminates are also available. Post legs elevate the unit to address cleaning concerns. The lightweight support frame is made of fully welded steel for superior strength and durability. Easy Access Hip Chairs are designed to benefit patients with partial or total hip replacements, arthritis or knee surgery. Getting in and out of the chair is made easier by the increased seat height, minimizing knee and hip movement. The footrest also assists users when sitting down and getting up. Spec is a proud supporter of AAHID! The American Academy of Healthcare Interior Designers is a dynamic organization created specifically for healthcare interior design. AAHID board-certifies interior designers who, through qualification, demonstrate the knowledge, skills and abilities required to work in the healthcare industry. The AAHID appellation recognizes excellence, commitment and knowledge. It further distinguishes preeminent healthcare interior designers from other architects, designers, decorators and interior designers. As a diverse organization, AAHID is working to raise awareness of healthcare interior design and working to improve the healthcare environment.